I have always been fascinated by Reality TV shows in the sense that I wonder what really goes on behind the scenes when the show is being filmed. In August I made the decision I would try out for American Idol in New York City. I knew I was probably setting myself up for an intense adventure in America's greatest city but I was suprised at how undaunted I was in pursuing it. The first thing I was made aware of is the fact that the auditions were in New Jersey and not in New York although they claim to be in New York. The reasoning for this is that the audition is actually split up into multiple days. 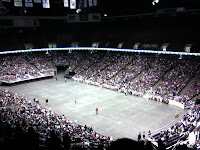 The first day is held in a stadium or arena and can feature as many as 20,000 applicants. Simon, Randy and Paula are not at this first event. People trying out audition with producers from the show and the producers themselves select the people who will advance to the "next" round. This next round involves a contestant who has progressed to this point to audition in front of several A.I. producers instead of just one. The contestant must also change their song selection and may be asked to sing a certain song by the producers. If the contestant makes it past this stage they will be asked to return to a new location at a different date to audition in front of Simon, Randy and Paula.